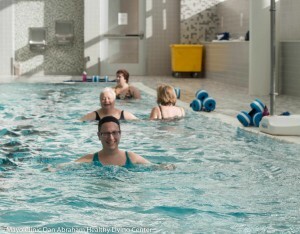 The other day I decided to try my first water aerobics class. At the time, I was just shy of eight months pregnant and knew that this workout would be a wise choice for my aching joints and muscles (due to the human growing and stretching inside of me…yikes!). I took Meg’s Tuesday morning Fluid Motion and Fluid Sculpt classes, and, WOW, what a great experience! I love to swim and be in the water as it is, but this was completely different than merely swimming laps in the pool lanes. In the Fluid Motion class, we jumped right into a series of cardio exercises back and forth, spanning the length of the pool. We performed such moves as high knees, scissor jumps and running sequences that were challenging yet fun. There was a poignant sense of comradery as you are typically right next to someone else and are able to encourage one another. What I love most about this class is that you can make it as challenging or light as you want. I come from a competitive athletic background, so it is almost impossible for me to take it easy. Therefore, it was so nice to be able to exert myself in the water without jeopardizing my somewhat fragile physical state. And I certainly worked up a healthy sweat, which felt so good! After Fluid Motion, I remained in the pool for the Fluid Sculpt class, where we performed weight training exercises with some cool contraptions I had never before seen or used. Again, I was able to choose the resistance I wanted at the time and then increase it or decrease it with each exercise. This felt so wonderful because I had just worked on my cardio and increased my heart rate, and now I was sculpting my arms, back, legs and abs in the water. Overall, I would take the classes again with or without being pregnant or injured. It is a perfect alternative to other forms of exercise and provides a burst of energy and rejuvenation afterward. I hope to see you in the pool!